I didn’t do any quilting this weekend. But between kids’ birthday parties, tae kwon do, ice cream dates with the nephews, the Bluth Family, those crazy kids Walter White and Jesse Pinkman and the kingdom of Westeros (what, we needed down time too), I managed to sneak to a quilt show for a few hours. 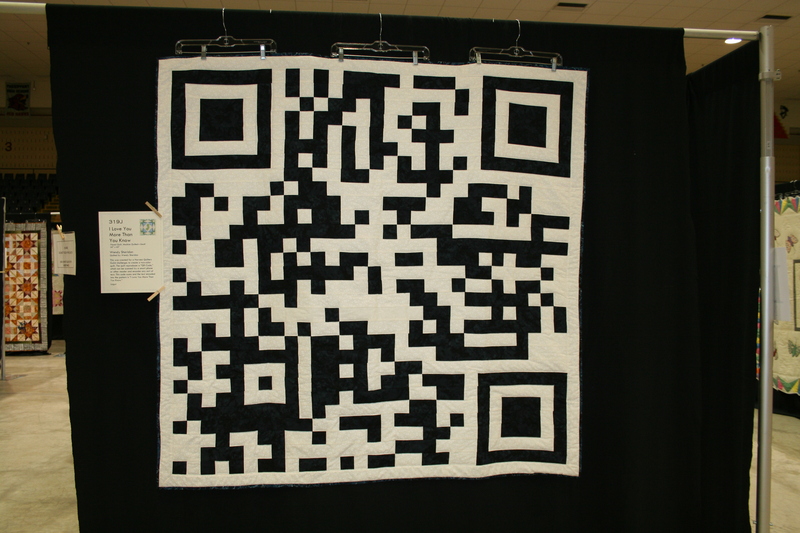 The Garden State Quilters are a local guild, and a few of its members are also members of our North New Jersey MQG. I wanted to share a few of my favorites from the show in Morristown, NJ this weekend. I’ll start with my favorite favorite. If you’ve read for a few months, you know I love black and white. And if you’ve seen my Pinterest board, you’ll know I like pixelated designs. It’s a QR code! If you scan it with your phone, it reads, “I love you more than you know.” It was made by Wendy Sheridan. 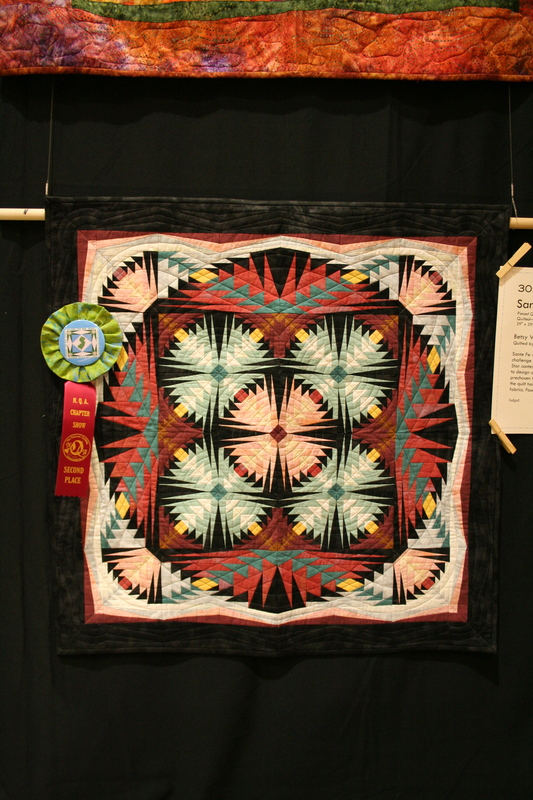 The sign next to it said that she made it as part of a challenge to create a two-color quilt. I love how it stood out in such a graphic way and had a wonderful hidden message. Another one that I really liked used my current obsession, right angles. I was experimenting with my camera’s flash and didn’t use it on this one. 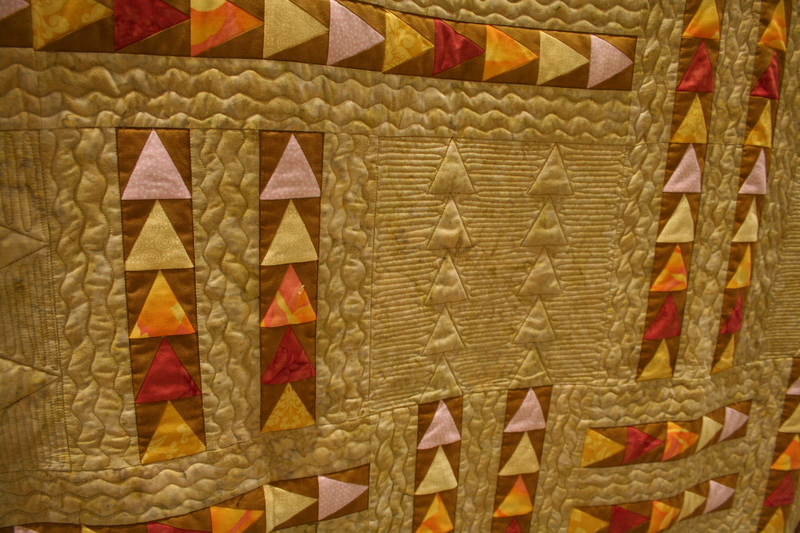 I think I captured the texture of the quilting, but it came out a little yellower than it was in person. 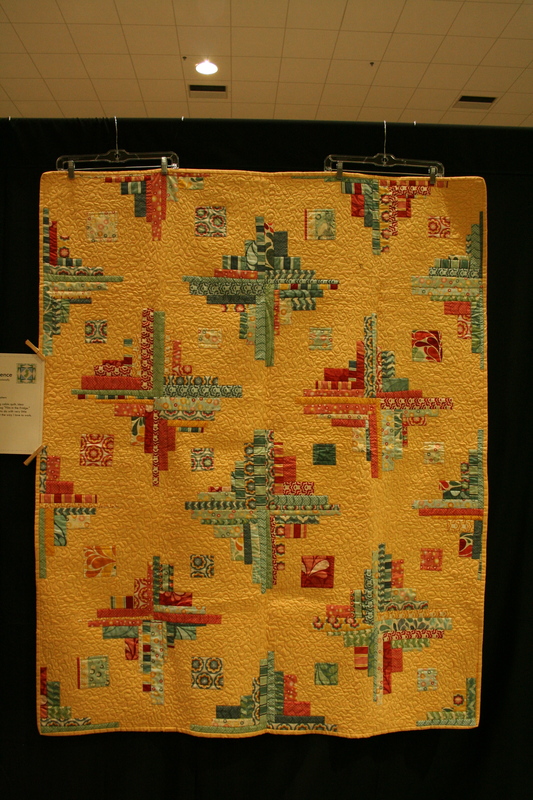 This one was made by Carol Esch and quilted by Lois Walters. The design is inspired by a quilt from Film in the Fridge. 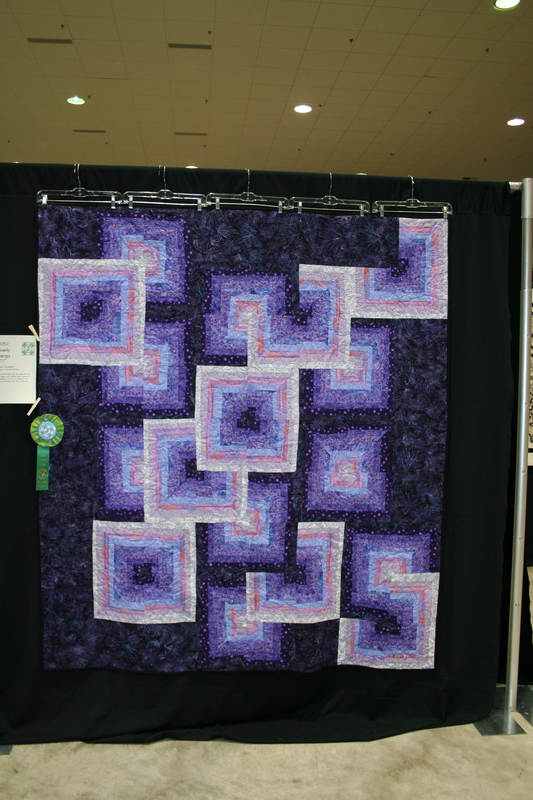 It’s called “Kinetic Energy.” Made by Gloria Cardello and quilted by Lorraine Dobbins. The information sheet said it’s from the pattern “4 and 6 Designs” by Barbara Pershing and Mary Hoover. I have no idea how this quilt was pieced. Curves! This one is called “Tangerine, Marigold, Coral, Flame.” Isn’t it groovy? I mean that in the best possible way. 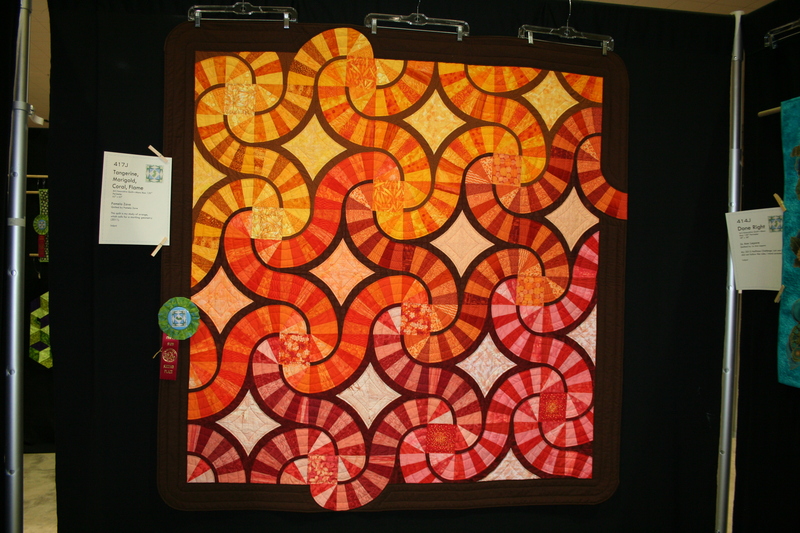 It’s a study in shades of orange by Pamela Zave. 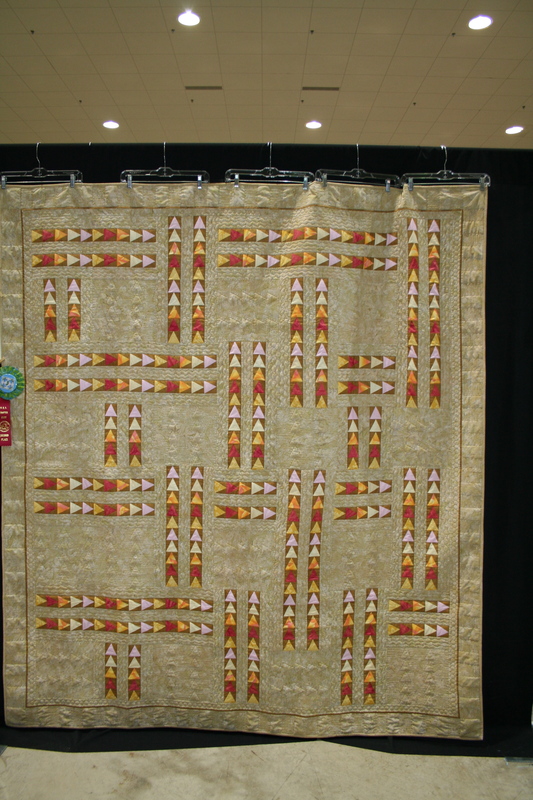 This quilt is called “Something Woven.” The design is by JoAnn Lepore with quilting by Ann Hutcheon. She does a lot of foundation piecing. It is amazing. 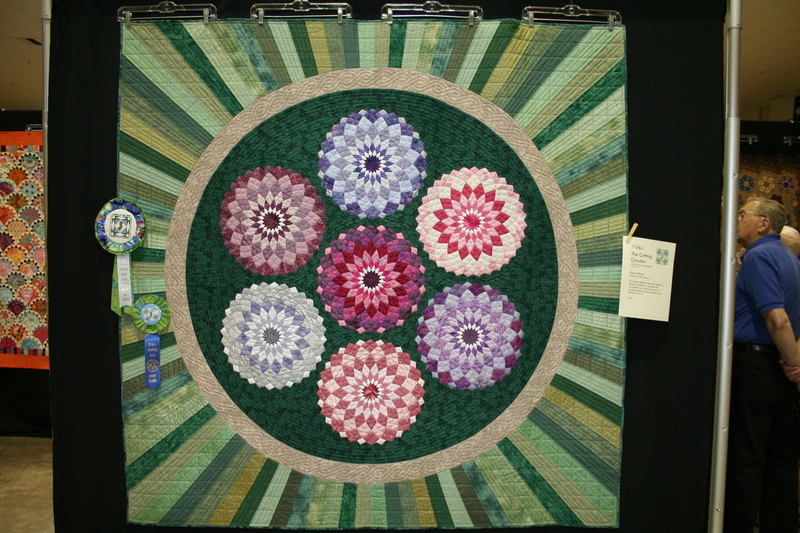 Best in show went to another MQG member, Dawn Hayes! How amazing are her dahlias? I have so many more quilts that I took pictures of, but this post is running a little long. I should probably be finishing some of my own work. So much inspiration! So proud of the NNJMGQ members! I knew I recognized some of those quilts! Wish I could have seen these in person – loving that log cabin/right angle quilt as well! I wish I had more time! And next time I’m definitely going with someone (please no guilt that you didn’t come). There was a lot to talk about, and everyone sees something different. As for MQG members, I forgot to mention Sue, and I ran into Josephine as well! Melaine thank you for sharing these amazing quilts!